Those of you who follow my blog know that I rarely create greeting cards because I simply don’t know what to do with the tiny space! 😀 A few days ago I decided to make an exception and this is how my 3rd ever greeting card was born. Ok, ok… I might have a few more from my early quilling days, but nothing decent enough to be posted here. It was made for a very special occasion: I finally got to meet in person my blogger friend and super talented lady quiller, Cristina from Cristina Fun Quilling. I can’t even begin to tell you what a kind, generous and beautiful person she is! At the beginning of this month she celebrated her birthday and I made this quilled card as a present for her. The base of the card measures 11cm and the same goes for the highest side in the center. The green paper is only 120gsm, but because of the card shape, it holds the weight of the white cardboard and the quilled elements very well. For the ladybugs I used 160gsm red and black paper and for the grass 120gsm and 80gsm paper. All the paper strips are 1.5mm wide. The text at the bottom of the card is Romanian for “Happy Birthday!”. If, for some strange reason, you are not familiar yet with Cristina’s work, make sure to visit her personal blog and Facebook page. Some of my other artwork with quilled ladybugs and grass: “Please Welcome… Spring!” and “Quilled Ladybugs in the Grass with Tutorial”. 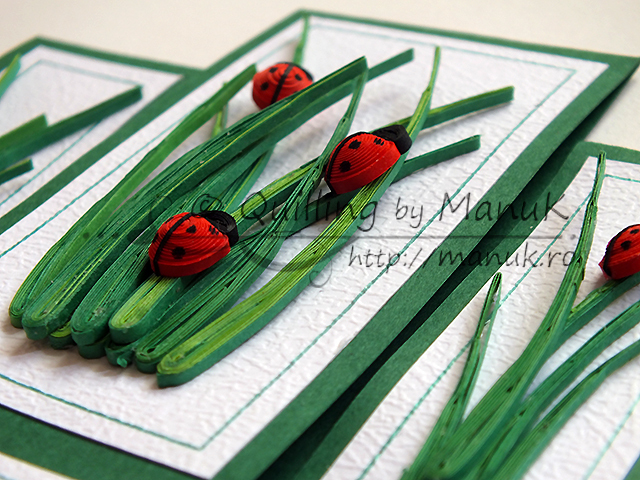 Quilled Ladybugs in the Grass with Tutorial Diamond Shaped Greeting Card with Quilled Flowers Have a Bright Day! – Quilled Greeting Card Quilled Flower Arrangement in Pink and Yellow Please Welcome… Spring! Lovely card, Manu!!! pretty quilling!!! Sathya, thank you very much! You’re always among the first to comment on my posts and I really appreciate it! You’re very welcome, Cris! I’m so glad you like it and I look forward to our next meeting, too! Beautiful, Manuela! I love all kinds of card shapes as well. Thanks for sharing this one. And I love your recent adventures with ladybirds on grass – it’s a great series. Loved this stepper card ! Can we hope to see more quilled cards now 😀 ? Manu I love your grass and ladybird design. It is so versatile and can be used in so many different ways and sizes! It must have been a wonderful meeting, two talented quillers meeting! Thank you for your inspiring comment, Nupur! Yes, it was a lovely meeting! I would give anything to be able to meet some of my other fellow quillers from around the world! Until then, I’m so happy we have the Internet to keep in touch! Manu, the ladybirdy card is awesome! It’s your mark I think 🙂 I can recognize them even without watermarks! Thank you for your lovely comment, Helen! I am really happy that you like my work! Hi Manu, This is gorgeous !! Great idea to use quilling on the stepper card, I also may give a try. And its great that the two nicest persons in the blogland ie you and christina met( only know both of you through your respective work and your encouraging remarks on my blog and hold both of you in high esteem)!! Do give it a try, Suman! It’s such a nice and simple design! Thank you so much for your lovely words! I want you to know that the feeling is mutual and it’s always a pleasure to visit your blog and admire your work! Manuela! Love the card. So sweet. Thank you for your visit, Sheila! Your comments are deeply appreciated! WOW!!! This card is really beautiful !! I always love these colours,green, red and black.. Love your work always!!! Thank you very much! This is one of my favorite color combinations, too! I love the strong contrast between red and green!